I chose Silken Tofu as this month’s egg substitute for the Egg Replacement Event, because I got a stunning result with this cake. So I thought that replacing tofu for eggs is going to be a breeze. Boy, I was so wrong! There are so many things to be taken into consideration while baking using egg substitutes and especially with silken tofu. I tried three recipes and only one turned out good. I don’t know what went wrong in the other 2 recipes. Is it the recipe or my baking method or the tofu? I want to share my experience with tofu with all of you. Hope I will be able to convey it all in a clear and concise manner. Feel free to skip my ramblings in the box below, if you simply want a recipe to bake eggless brownies. I bought Nasoya’s Silken Tofu as I did for the eggless chocolate cake. My son has started preschool and next month he is responsible for providing snacks for his classmates for 2 days. So I thought I will try something now and if it comes out well, I can bake them again next month. Since I wanted to send something healthy, I decided to try oatmeal raisin cookies from here. 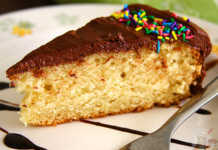 The 5 tablespoons of margarine impressed me especially to try this recipe. I decided to follow the recipe as it is, but for using 1/4 cup pureed tofu instead of the 1 egg mentioned in the recipe. To start with, I was not able to beat the 5 tablespoons of margarine to a creamy consistency. The margarine was nice and soft, but most of it was just sticking around the bowl. Even after adding sugar and beating it with a hand held electric mixer, I did not see anything creamy. Then I did another blunder of adding the pureed tofu and beating it again, just to see the tofu curdle. Small tofu lumps were swimming in a white color water. In spite of this, I continued to proceed with the recipe. I poured the entire mixture of creamed margarine, sugar and tofu in a blender and blended it until nice and smooth and to my surprise it did look good. Nothing to complain at all. Another substitution I made was adding 1/2 cup of whole wheat flour instead of entire 1 cup all purpose flour. Mixed the flour, oats and raisins with the wet mixture and got a big ball of cookie dough. It was not moist like the other cookie doughs I have handled so far. I was able to roll them into balls easily and placed them on the baking sheet. I thought that while baking the dough would flatten, but it stayed just like that. So it did not cook properly and I had to keep increasing the time. For the second batch, I flattened the dough while placing it on the baking sheet and in spite of that it did not bake enough in the center and I had to bake it for a couple minutes more for this batch too. It did not taste anything like the oatmeal raisin cookies I have eaten before. They were not baked enough, did not have the right texture and definitely not sweet enough. I think the result would be good, if the original recipe is followed. With so many substitutions by me, it was such a mess. Then after going through a couple of books and other internet resources, I found that tofu works best in cakes and brownies. 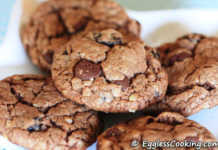 Ground flax seed gives the desired results in cookies, especially oatmeal cookies. So decided to try a cake recipe using tofu. Since I have already baked a chocolate cake using tofu, I wanted to try a white cake this time. Found this recipe interesting because of it’s simplicity, fat content and good reviews. For this one I added 1/2 cup pureed tofu and sugar in a blender and blended it until creamy and followed the recipe exactly, but used muffin tins instead of a round cake pan. Somebody in the review had mentioned that the muffins came out well and I wanted to try it out too. Even though it looked decent, it did not have a soft, spongy texture at all. So I was pretty sure that it’s not going to taste well and I was absolutely right. It had the texture of rubber and was way too sweet. I was really disappointed about how these recipes had turned out. Since I started this blog in March, this is the first time my baking experiments have failed, especially two times in a row. I had only little tofu remaining and I decided to try another recipe immediately because the tofu has to be used within 3 days after opening the box. This time I considered 2 points before choosing a recipe, (a) there should not be any creaming involved (I think that beating the tofu was the mistake in the above two recipes) and (b) since my eggless chocolate cake came out so well, I wanted to try another recipe with cocoa. I don’t know if it’s just a sentiment or there is really some science behind it, just like coffee and cocoa, the tofu and cocoa combination also works like a charm. I tried this brownie recipe with tofu instead of eggs and got a wonderful result. We did not taste the tofu at all and I bet nobody could ever tell that they are eggless brownies. I also wanted to try a brownie recipe because the one which I have posted earlier was baked using a store bought mix, which I think is available only in US and Canada, maybe UK too. The original recipe itself is very simple to follow, but I made it even easier by using just one mixing bowl. So it’s not only an eggless brownie but also a one dish brownie. Also these brownies are dense, moist and chewy. 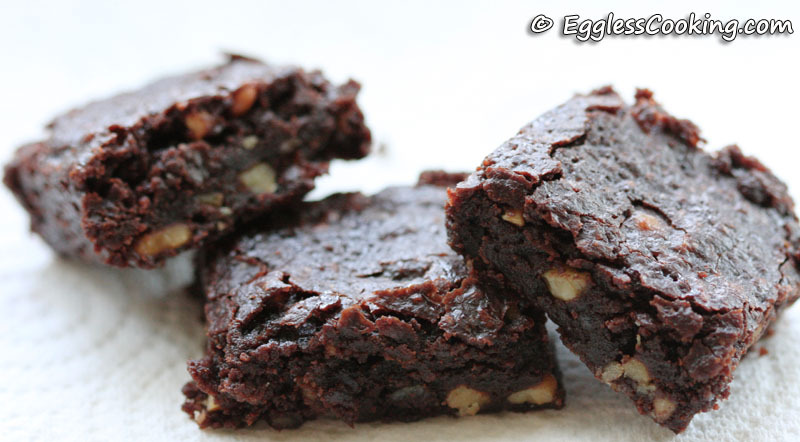 Bake eggless brownies right from scratch using pureed silken tofu as an egg substitute. For a vegan brownie recipe use any oil of your choice instead of melted butter. Preheat the oven at 350F/180C for 15 minutes. Cut the butter into small pieces and add it to a medium sized microwave safe bowl. Melt the butter in the microwave. Mine took 1 minute to melt. First I timed it for 30 seconds, stirred it and kept it for another 30 seconds. Remove the bowl from the microwave and let it stand for a minute. Now add the cocoa powder to the melted butter and combine it well until the cocoa powder dissolves. I used a wire whisk. Slowly add the sugar too and mix it well using a whisk. The mixture will look very stiff, making you wonder if you are doing the right thing. So don’t panic. Now add 1/4 cup pureed tofu and combine it well and then add the remaining 1/4 cup of tofu also and mix it well again. Next add the vanilla and salt too. Add the flour next and mix it until you no longer see any flour and also add the nuts or any other optional ingredients mentioned. Even now the dough is in a semi solid/spreadable butter consistency only. It’s not as watery as a cake batter that you can pour in a pan. To check for the doneness, the author of the recipe has mentioned that the toothpick inserted should come out with moist crumbs and not clean. Mine did not come like that after 25 minutes, so I baked it for another 3 minutes and even then it did not come like that. So I removed it from the oven anyway and kept the pan on a wire cooling rack to cool. Because of baking a couple minutes extra, I think the top was mildly dry. I would suggest baking it for just 25 minutes and it will continue to bake even after taking it out of the oven giving the correct texture. Cooling completely is a very IMPORTANT point too. So leave it undisturbed until the bottom of the pan is completely cool or for 2-3 hours and then slice it. At first I tried to slice it while the pan was still mildly hot, but was not able to cut properly. So I left it cool overnight and sliced it in the morning and got nice, clean pieces. This recipe was updated and republished from the 2009 archives. 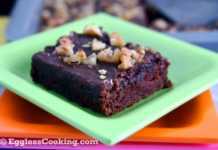 Lovely brownie recipe, Madhuram!! I made these brownies with white chocolate chunks. I have fallen in love with eggless baking thanks to your blog . A big thank you for providing a platform for other passionate bakers to venture . Although , I found that the brownies were a tad too sweet . Would 2 tablespoons less of sugar hold good ? Thank you very much, Angela. It should be fine reducing the quantity of sugar to some extent. Have you tried to freeze these brownies? No I haven’t, Andrea. I think it should be fine though. These turned out great. I used pecans and it was very moist the way I like it. Only change I made was halve the sugar and it was plenty sweet. Thank you for the awesome recipe! I tried them for the first time and they turned out so good. My kids loved them. My first try at Brownies and… Success!!! Added Hazelnuts and chopped dates. Great eggless recipe. My boyfriend is allergic to eggs, so this was his first chocolate brownie ever (his face was a picture!). Oh wow! Thanks for giving it a try and I’m happy that it worked out for you. You won’t be able to taste tofu at all, Vandana. Take my word for it. It will keep good for 2-3 days maybe at room temperature and more in the fridge. Awesome recipe. Brownies turned out delicious. Thank you.